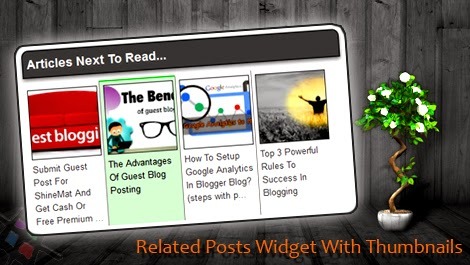 Home > Blogging > How To Add Related Posts Widget With Thumbnails In Blogger Blog? Few days ago we have shared how to install text version related post widget in blogger blog. Today we have come with a new thumbnails version related post widget. We know that showing associated posts from same labels just at bottom of each post will definitely increases the pageviews. I have customized the CSS codes as just I like. You can also customize this related post widget as your blog’s theme color to see friendly. Important Note: To make this blogger widget properly worked, make sure you have add labels to your every blog post. Otherwise it won't work. Okay! Now let’s setup the related post widget with thumbnails in blogger blog. ALSO READ: How To Install Google Analytics In Blogger Blog? 8. Now paste the following CSS code just above/ before </head> tag. 11. Finally click Save Template button to complete. SEE ALSO: How To Change Newer, Older And Home Link With Image Buttons? 1. Change the var maxresults=4; number with your own number of posts that you want to display. 2. To adjust the widget headline's width just change 450px with your desired width value. 3. To change the headline title simply change the text "Articles Next To Read..."
That's all friends. I have tried to explain everything as easy as I can. If you have any question about this please feel free to ask me. I am here to help you. Happy blogging pals. Remember me in your prayers. Allah Hafez.